I am not exactly sure how to read this chart, but is it really saying that Tyroleans and Tuscans are more closely related to Pakistanis than to each other? That's pretty hard to believe. MDS does not preserve the genetic distances, so populations that are closer in the 2D plotted surface could be further away in terms of genetic distance. My guess is that Sindhi are composed to a great extent by R1/J chromosomes which would make them somewhat similar to these two populations. They really need to do more of these genetic charts in 3 dimensions since 2-D is often misleading when it comes to certain information. 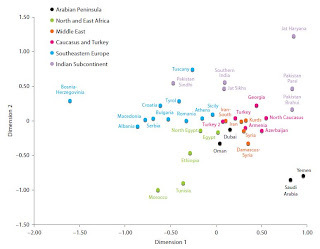 The different ethnic groups, based on genetic information would be suspended within a cube. It shouldn't be too tricky to create these "cubes". "while Saudi Arabia and Yemen show a relative distinctive isolated background. Those two populations may have been kept relatively separated from migration routes". Including any 'original' out of Africa one? Doesn't that blow the Bab al Mandeb route out of the water, so to speak? Not really. The Bab al Mandeb route is for a totally different group of humans who ultimately contributed to the formation of ethnic taxa in Australia, SE Asia and the Asian Mainland. Arabians do not have anything to do with that earlier migration as their ancestors were still in Africa. Arabians, that is peninsula Arabians are of Northern origin, from the Levant and came into Asia via the Levantine corridor. You have to remember Yemeni are skewed due to their marriage customs on the male line. They are atyptical similarly to Basques in Europe. Think of Muhammad's family, his cousin Ali married Muhammad's daughter Fatima. Those type of marriage customs tend to skew haplogroups into anomalous frequencies. An earlier report on the Arabians in the Gulf of Oman stated that Yemeni Y haplogroups are quite homogeneous lacking diversity. It is just the effects of inbreeding. "The Bab al Mandeb route is for a totally different group of humans who ultimately contributed to the formation of ethnic taxa in Australia, SE Asia and the Asian Mainland". That indicates you maintain there were two movements out of Africa whereas it seems generally accepted there was one. I suspect that if it were possible to extend the diagram beyond India to include Australia, SE Asia and the Asian Mainland we would find the cline simply continues. I ran the haplotypes through Athey's predictor. I pooled Dubai with Oman and Yemen with Saudi Arabia, for ease of presentation. Oman" didn't find any "I" in Qatar/UAE/Yemen; otherwise the estimates seem reasonable. Oman" didn't find any "I" in Qatar/UAE/Yemen; otherwise the estimates seem reasonable.The likelihood scores for the predicted "I" haplotypes were generally lower than for other haplogroups, so maybe there is some misprediction going on there. The Athey predictor's median likelihood for the I group was 86%, whereas for the non-I group the median likelihood was 99%. look at this idiot sardines moroccans are caucasians and ethiopians are hybrid lol. Sooner or later these boneheaded people will have to realize that no amount of lies can cover-up the glaring and stubborn facts. The foundation of much of human culture and civilization emanated from the ancients of Northeast Africa and the mediterrenean of which the people of the horn are a remnant. Oman and Dubai have significant T and E3b1 precisely because they are coastal areas at the gateway waters to important regions and markets. Ancient colonies established by northeast africans puntites who were the architect of maritime and much of land based trade routes in the ancient world, even as recent as the 13th century ibn batuta writes that these cushitic northeast africans were grantors of the indian ocean safety... "These latter are the guarantors of safety on this sea; let there be but one of them on a ship and it will be avoided by indian pirates and idolators". The universal megalithic culture, the sea peoples, and pheonicians were off shoots of this pioneer culture. Its why the coastal regions of the lebanon has higher percentage of the above markers, if you survey important coastal areas in southern area particularly close to hormuz you will see the same think, also in india and china etc., these are the facts if you don't buy it wait as evidence continues pour in and the stubborn truth can longer be denied.